Come and discover Parque Patagonia…before everyone else does! The latest addition to the Patagonian hiking scene, Parque Patagonia is just one more step towards the creation of one of the world’s largest protected nature reserves. What started as a mere dream for an intrepid, determined and affluent American couple has turned into a reality that is hard to criticize. But it does seem that grandiose projects and criticisms come hand in hand, no matter how noble intentions may be. But let us regress just a little. Let us introduce you to Parque Patagonia. Parque Patagonia is in Chile and stretches alongside the border with Argentina, about half way between the Chacabuco Valley and Villa O’Higgins, at the southern tip of the Carretera Austral. In this remote corner of the globe, getting anywhere is an adventure in itself, one that is bound to leave you more than speechless. Along the 2,000km unpaved road, you are privy to some of the most outstanding scenery in the entire continent. Sweeping valleys, vertiginous peaks, verdant rainforests, startling lakes and rivers are you constant companions. You’ll experience that overwhelming feeling of immense vastness which very few destinations in the world can gift. Open from October to April, the park offers free public access and, as long as the last finishing touches are still in the making, you are advised to be completely self-sufficient during your visit. There are, however, a few beautiful lodges just outside the park boundaries which make for fantastic base points. Lodge stay in Parque Patagonia. Hiking, camping, fly fishing and bird watching are just snippets of all that Parque Patagonia offers the intrepid adventurer. Amazingly, you can also simply drive through the park in a little under two hours. This is an incredible opportunity for all those who wish to experience the awe-inspiring beauty of Parque Patagonia but don’t want to – or can’t – include a strenuous hike. From here, it is also easy to continue further south, visiting Torres del Paine and Los Glaciares National Park. Covering an area of more than 2,600 square kilometres, Parque Patagonia is the latest chunk of private Patagonian land owned by Doug and Kristine Tompkins (of Patagonia Inc, North Face and Esprit fame) which has been turned into a public – and fiercely protected – park. The Tompkins are no strangers to controversy in Patagonia, although it warrants to mention that none of the criticism is directed at the land or their preservation projects, but rather the fact that they are foreigners who own a substantial portion of Argentinian and Chilean land. To call the Tompkins environmentalists would be far too simplistic. Together, they created Conservación Patagónica in a part of the world they have both loved for more than three decades. The Tompkins have been involved in conservation here since the 90s and, once their business exploits made them billionaires, they started buying up swathes of land and returning them to their natural state. The project helps empower local communities whilst restoring wildlands and biodiversity in the region. The need to keep these lands protected is not inconsequential. Deforestation, as well as gas and mining developments, have been threatening the region for years. There have also been talks of building a hydroelectric plant here, effectively damming two of the largest rivers in Patagonia. For flora and fauna this would be catastrophic to say the least. CP aims is to create a single Patagonia National Park which is set to be Latin America’s largest and most prized nature reserve. Doug Tompkins perished on an adventurous expedition in Patagonia last year, but Kris marches forth with great vigour, intent on seeing their dream to fruition. Topping Patagonia’s already existing national parks is a hard thing to do. One of South America’s best hiking destinations and a place that takes ‘the end of the world’ to whole new level, Patagonia is that stupendous southern tip of South America that’s shared by both Argentina and Chile. It is sparsely populated by man and filled, instead, by breathtaking natural wonders. It kisses the base of the Andes and is dotted with snow-capped peaks, glacial lakes, steppes, deserts and the most colour-intense forests you’ll ever see. Patagonia is over 1 million square kilometres of heaven on earth. 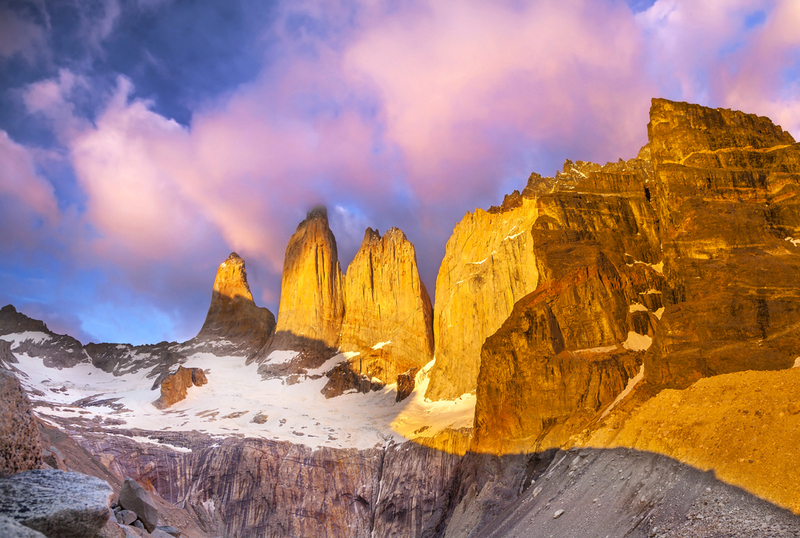 Torres del Paine is arguably Patagonia’s most celebrated highlight yet what many don’t know is that this is just a small portion of a spine-tingling ridge of peaks which stretches for more than 4,000 kilometres. You could hike in Patagonia every year, for decades on end, and never have to backtrack. This is a nature lover’s Utopia, a haven where you can truly immerse yourself in pristine wilderness, experience climate extremes and soak up an unrivalled sensory overload. One of those rare places left on earth where nature shines resplendent, in between those times when it howls with tremendous fierceness. Dreaming of a nature-filled adventure at the end of the world? Don’t hike past Patagonia! Check out all the unforgettable Patagonia tours we offer, or let us create a bespoke itinerary for your next South America adventure. After all this is what we, at Chimu Adventures, do best. We can take you to Parque Patagonia, Torres del Paine and Los Glaciares National Park, among many other fantastic destinations. If you’re at all worried about the kind of accommodation options you’d have, let us assure you that the best Patagonian lodges will offer you superb comfort and spectacular viewing.